"Hey, Lis, guess who's got a genuine Itchy & Scratchy animation cel?" "Oh! That is so cool! That is so exciting! That is so...[looks at cel] crappy." Lisa looks at the cel. The Itchy & Scratchy animation cel is an animation cel from The Itchy & Scratchy Show. One evening, Bart watched a show on the Impulse Buying Network, hosted by Troy McClure, on his portable TV. On the show, Roger Meyers, Jr. advertised an Itchy & Scratchy animation cel, a limited edition with 800,000 copies, and promised that the animation cel would increase in value. Bart wanted to obtain the cel, which cost $350. As a ruse, he bumped into Homer in the hallway and apologized, stealing Homer's wallet under the cover of the bump. Homer, for his part, used the bump to steal Bart's slingshot. Bart then called the show and placed an order for a cel, using Homer's name and Visa card (after first attempting to use Homer's "Federal Breast Inspector" card and "License to Ogle"). Some days later, the doorbell rang and the person at the door had a "special delivery for Homer Simpson". Bart, who was expecting the cel to arrive, answered the door as Homer, and got a punch in the nose for writing letters to Mr. Sinatra. The doorbell rang with another special delivery for Homer. Bart answered the doorbell as Homer again and got another punch in the nose, this time from the Squeaky-voiced teen for stealing golf balls from the driving range. The doorbell rang a third time, but Bart ignored it. The deliveryman shouted that Homer had a special delivery. Bart looked through the letter slot and saw the deliveryman holding a cylindrical box (labelled "Do Not Roll") which contained the animation cel. Knowing that it was the long-awaited cel rather than another person wanting to punch Homer in the nose, Bart opened the door and the deliveryman handed Bart the box. The deliveryman then punched Bart in the nose for keeping him waiting. Excited that the animation cel had finally arrived, Bart told Lisa about it, and she became excited as well. 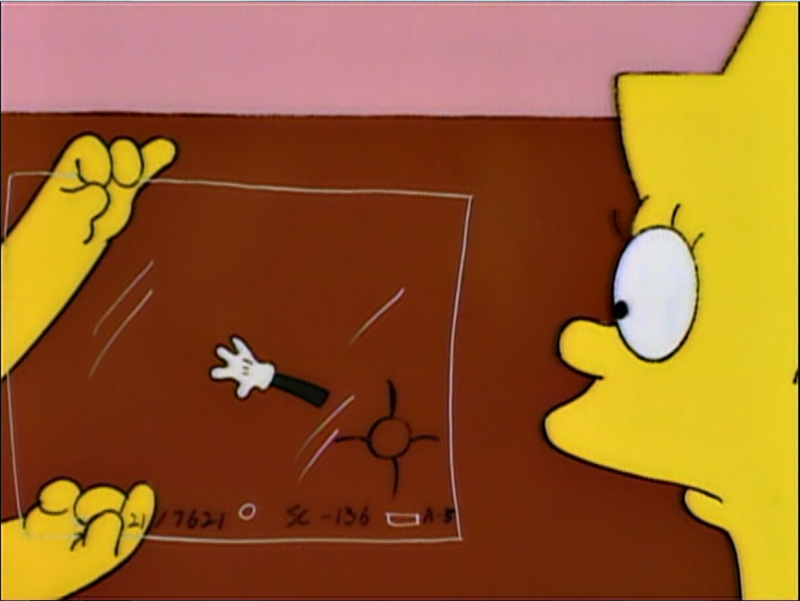 Bart opened the box in front of Lisa, but they were both disappointed to find that that the cel showed only Scratchy's arm and some animation reference marks. Bart, crestfallen, realized that there could be trouble because he had used Homer's credit card to buy the cel which had turned out to be a huge disappointment. Lisa asked how much the cel was and Bart said that it cost $350. Later, Bart decided the cel wasn't worth keeping. He took it to The Android's Dungeon & Baseball Card Shop and asked Comic Book Guy whether the cel was worth anything. Comic Book Guy said it was worth nothing, but offered to give Bart a telephone shaped like Mary Worth in exchange for the cel. Bart accepted the deal, albeit rather reluctantly. Later, Mr. Burns dropped by to take Marge's mother on a date. Bart immediately realized that Burns wanted to make a good impression on his grandmother, and decided to take advantage of the situation. First, Bart said that his grandmother liked it when her boyfriends were nice to him; particularly, when they gave him money. Burns was unimpressed and told Bart to go away. Bart then held up two squirtguns, one filled with ketchup and the other with mustard, and demanded that Burns give him $350 or Bart would ruin Burns' suit by squirting the condiments over it. Burns responded defiantly ("You don't have the guts"), and after a brief staredown Bart gave Burns' suit one squirt of mustard as a warning shot. Now convinced that Bart was serious, and upset about the mustard on his suit, Burns gave Bart the money. That evening, Bart decided to come clean with Homer and told him about charging $350 on his credit card. Homer at first freaked out, but Bart told him not to worry because he had the money, then gave him the $350 cash he had extorted from Mr. Burns. Homer was jubilant about the cash and talked about spending it on seventy Nightline transcripts. Bart tried to explain further, but Homer was so happy about the cash that he completely ignored him. Bart decided that since Homer was happy, the situation was resolved. Bart then told himself that he would keep the Mary Worth phone so that "Her stern but sensible face will remind me never to do anything so stupid again." Just after that, the phone rang. The caller was Milhouse, who asked him if he wanted to play with the X-ray machine in the abandoned hospital. Bart said "Sure!" and hung up. Nightline is a late-night news program that airs on ABC. At the time "Lady Bouvier's Lover" aired, the program offered transcripts for $5. Modified on September 1, 2012, at 05:12.